Long-form content is dominating the first page of Google. 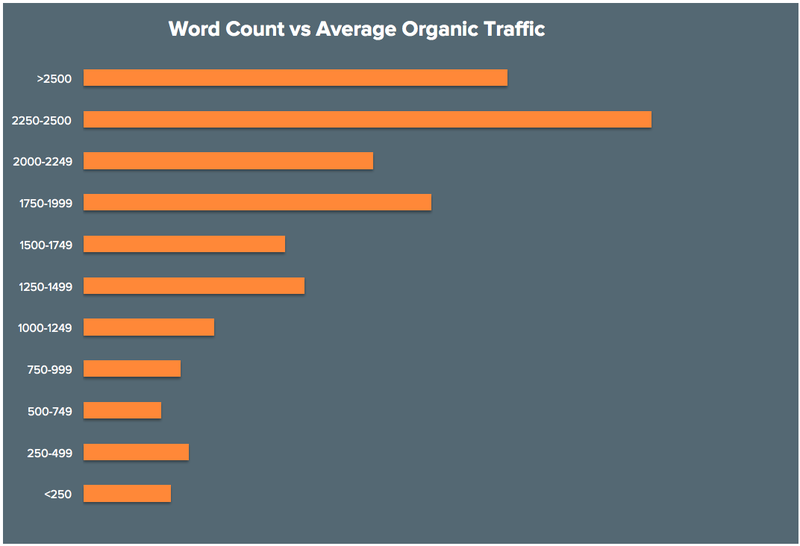 A recent study that I ran across all of the content on the HubSpot blog (nearly 7,000 articles) found huge correlation with content in excess of 1,500 words and large volumes of traffic coming from organic search. Longer, more detailed content is often linked to more frequently and contains larger volumes of text that Google can use to build relevance against keywords you’re trying to rank for. Whilst there are obviously exceptions to the rule, it’s fair to say that long-form content is significantly easier to rank higher in the SERPs for competitive keywords than shorter content. Typically, the longer the length of a piece of content, the more difficult it is to keep a reader engaged. Long-form content is often broken up with imagery or interactive elements to make it easier to consume. This increases the impact of banner blindness, which will negatively impact your ability to get users converting through CTAs. User experience and conversion optimisation are tightly intertwined in both of the above situations. A perfect example of this can actually be seen within some of the CTAs within long-form content on the HubSpot blog. We found that within a lot of our posts that were greater than 1,000 words in length, the image CTAs at the end of our articles were receiving alarmingly low click-through rates (sub 1%). We noticed that although our CTAs were receiving low volumes of clicks, the click-through rates on the internal links within the articles were still relatively high. What we needed to do was alter the user experience that the user was receiving to fall inline with what they were comfortable with. We removed the image-based CTAs that were clearly falling victim to banner blindness and added plain-text CTAs closer to the top of the articles. The click-through rate increased to an incredible 5% average. People were clicking the plain text CTAs more because there was less noise around them and they were closer to the top of the page. Was there a way to solve problem number 1 and problem number 2 at the same time? A lot of blogs that I read have sections at the end of them that often come under the header, “TL;DR” (short for too long; didn’t read), that would summarise the whole article into a concise number of key points. The idea here is that readers that are in a hurry can get a quick overview of the main takeaways of the article without committing to reading 1,000+ words. This is great but it’s largely flawed because you’re relying on the reader scrolling through until the end of the article to view this, which if they’re in a hurry then they won’t. Not only that, but if you’re telling the reader everything they need to know in a few quick bullet points then surely they’ll just quickly read them and leave, right? Not great if you want them to convert through one of your CTAs – let’s say to subscribe to your mailing list. How about offering a button at the start of the article that enables them to display a customised summary of the long-form article they’ve come through to? Furthermore, they will see a targeted CTA at the end of the summary that avoids getting lost in the main body of the article. For users in a hurry, especially mobile users, they can have the option to view a quick summary of the content – this improves user experience. 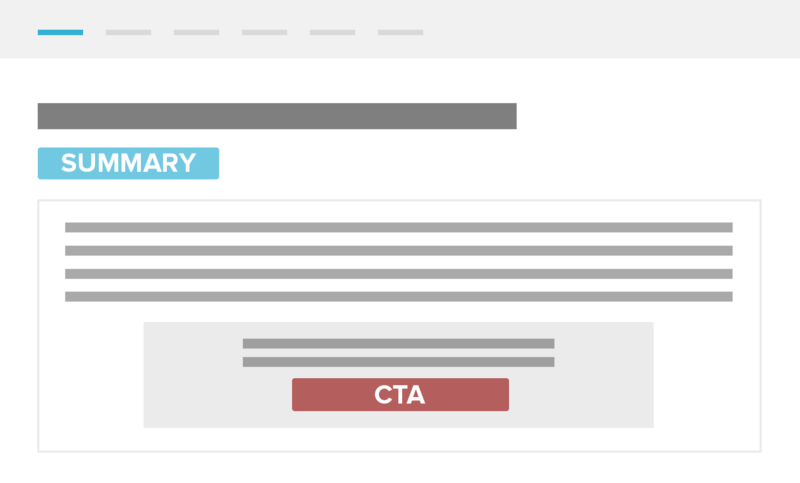 The CTA that you display to your reader will avoid succumbing to banner blindness and can further play on the fact that they want quick information by offering something with added value that solves this. An example could be a PDF version of the article for easy offline reading at a later time. One of the best things from a user experience perspective is that you’re not interrupting them; you’re actually adding more value to their visit. This is the polar opposite to the interruption tactics that the likes of pop-ups use. The free tool that I’ve created, currently only for WordPress websites, enables you to add custom summaries to your blog content with custom CTAs for each post (see how to install TLDR here). Start improving the user experience within your content and increase the number of leads you're generating at the same time with TLDR (WordPress only). The summary button will only display for content where you’ve added summaries so that you don’t need a summary for everything you’ve put together – only the ones that you choose. Alongside all of this, the CTA design can be completely customised to fit in with the style of your website. Try it out for free and start solving the issues that your users are facing with long-form content. You can see it in action at the top of this blog post; just click on the 'Show Article Summary' button. Stop interrupting; start adding value. This is brilliant, thanks for getting it built! For clarity, I know that functionalities for content like “accordions” are sometimes not good for SEO purposes because Google’s algorithm is unable to index the hidden content. Am I correct in assuming that since the article is initially shown in full as opposed to being clicked to expand like an accordion, that this feature does not negatively affect SEO? Hey Ryan. Exactly. I made the plugin function specifically in this way. Even better, the summary content is also indexed along with the full post content so that you boost the amount of indexable text on the page. Excellent! Thank you for the added information. Great plugin/tool/idea. Going to give it a go! Thanks again! If the summary is plucked from the original, full-length article – Would it be indexed as duplicate content since both bodies are indexable by the search engine? Hey Ryan, no it won’t. Duplicate content isn’t an issue within the same page – Google can’t punish you for essentially copy/pasting the same text on the same page, especially in this kind of volume. Duplicate content issues only arise when you have the same content on multiple pages across your website and other websites. So, in short, you have nothing to worry about at all. Matthew, thank you for the plugin. It’s sad I don’t have much traffic for testing it. I also thought about the problem of lengthy posts, because my posts are always longer than 4.000 words. Many people always in a hurry, so our task it to get them hooked. Your plugin is the hook that we need! I’ve got a question: could you please also add the support for codes from Thrive Themes for CTA? Thanks for the feedback 🙂 If you want to add in custom CTAs via shortcodes then you can always disable the TLDR CTA and just add the shortcode in the summary description section. Each time when i visit your blog you surprise me with a killer stuff so nothing different here.Thanks for making this Matt and not making fluff content to add up more posts to your blog. Do you have said tool that would work with Hubspot for blogging? This is really cool Matthew. Love how you are tapping into an existing concept that is popular online and is beginning to be needed as content continues to get longer and longer. this improves user experience. Thank you for sharing. Thanks and Keep posting more!! Killer idea – way ahead of the game; frankly, you’re a tough one to keep up with. I’m still over here blowing everybody’s mind with scraping (another topic you turned me on to) and you’re over there building things like plugins? Leagues ahead, and I look forward to checking the plugin out. Happy to see you’re putting more content back out there for us moochers (I feel like it’s been a while, but maybe I’ve been bad about keeping up). I was not glad, however, to come back and see you’ve stepped your game up yet again. Now I have to learn to build plugins to stay competitive? Good stuff, I’ll try and look forward to weekends at my desk. I love this article! It’s been such a push to stay focus and motivated. Thank you so much! Did you remove this from this blog post? I wanted to see it in action, but can’t find an example. Hey Dave, yes – I just redesigned the site and haven’t got it back up and running yet. Will have this back up and running in the next couple of months. Awesome. I downloaded it anyway and checked it out. Great idea! Trying to replicate it for a non WP site now. Pretending I know CSS.